Sirma Bilge is a Professor of Sociology whose work engages with the intersections of social formations of race, ethnicity, gender, sexuality, and class and examines how notions of of national/ethnic sameness and otherness articulate themselves through gender and sexual regulation. A daughter of the Indus River and the Sindhu people, Kanwal Rahim weaves dance, storytelling and humour into her artistic expressions and performances. She explores new body wisdom practices and healing traditions to deepen awareness and connection, while honouring the integrity of the body. 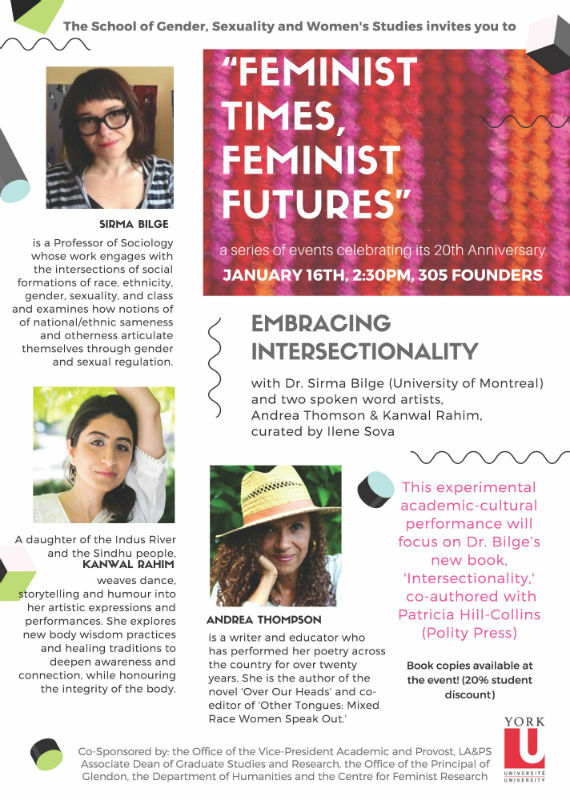 Co-Sponsored by: the Office of the Vice-President Academic and Provost, LA&PS Associate Dean of Graduate Studies and Research, the Office of the Principal of Glendon, the Department of Humanities and the Centre for Feminist Research.